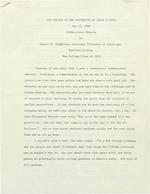 NEW COLLEGE OF THE UNIVERSITY OF SOUTH FLORIDA May 23, 1986 Commencement Remarks by Daniel F. Chambliss, Assistant Professor of Sociology, Hamilton College New College Class of 1975 Imagine, if you will, that I gave a traditional commencement address. Graduates, a commencement is not an end it is a beginning. The generations that have gone before you have not done a very good job. Our mistakes we now pass on to you, and you must rise to the challenge and do better than we. The education that you have received here will allow you to respond to this challenge of saving the world from the mistakes of earlier generations. It has prepared you to meet the challenge of a fast changing world, to take your place in the march of history, etc., etc. As John Fitzgerald Kennedy once said, "The torch has been passed to a new generation. Ask not what your country can do for you --ich bin ein Berliner." And at that point everyone applauds wildly and the tent falls down and we all go home. I couldn't give a talk like that today. I'm a New College graduate and you people are about 15 minutes away from being New College graduates and we wouldn't buy it. But you should know that these words are being spoken to practically every college graduate in America today. And most of it's garbage. New College Commencement Remarks -Chambliss Page 4 was sitting there, leaning back in a chair out front, reading a book on "Quantum Mechanics, Physics for Fun." He pumped my gas and did a good job. I don't want to shock you but you don't see a lot of this in the rest of the world. He was a New College student. For some of you I'm afraid that this may mark the end of your life as intellectual beings. For some of you, I'm sure that this day marks the end of your freedom to be a jackass without getting punched in the face. The students know who I'm talking about. For some of you this day marks the end of a love affair or maybe of being your own boss. For some of you, perhaps many, today will herald the end of a truly stunning South Florida tan. Now the cliches then, about college education, or even the white lies about college education don't seem to apply although you do find them everywhere. Allow me a modest example. In my hand 1 have the catalog from one of the finest colleges in America. In the early pages of that catalog this college stresses ingredients critical for excellence, an abundance of educational opportunities, a variety of ways for students to use those opportunities, and full student participation in the planning of their educations. At this college students do in fact shape their own educations. In the descriptions of one of the majors of that college we find in addition that this major encourages and develops independence. So we have independence, participation in planning, shaping their own education and the major itself details 18 specific courses that one is required to take to get that major. Not six, or eight, or ten, 18 specific courses and so on. This is odd. The major is chemistry. The college is New College. And the significance of that I leave up to you to decide. New College Commencement Remarks Chambliss Page 5 None of this--chemistry major, commencement as an end, what education may or may not give you--none of this implies that your time here has been wasted. Two things, at least, you have gained here. First, you people actually had to do something to graduate from college. Just being on campus for three or four years, or 11 for one of you, did not insure that you would receive a degree. You had to sign some contracts. You had to do some ISPs (Independent Study Projects). You had to manage a senior thesis and a baccalaureate examination despite the fact that one of the people gave you a hard time. Even if you've done a lousy job of your New College education, and some of you have done a lousy job of it I'm sure, the fact of simply having done something once in your life, separates you from most of the college graduates and virtually all of the high school graduates in America. And if this seems to you a pretty minor accomplishment let me remind you that, as Woody Allen once said, 90 % of life is just showing up. Second, even though you are now leaving, and the future of the world may not look especially bright, and your education probably won't help you fit in, at least you can still hang on to your B.A. and know because New College showed you at least one thing, people can have fun talking about ideas, argue for hours without becoming enemies, people can contradict the authorities without becoming traitors. The chances for speaking honestly are in some danger today, what with libel suits, defamation of character suits, charges of espionage leveled against the newspapers that publish classified documents, outbreaks of book-burning in North Carolina, censorship of all kinds, activities of groups like "Accuracy in Academia," "Accuracy in Media" and what with the general kind of attitude that the press or anyone who expresses their opinion openly is somehow threatening the existence of the Republic. New College Commencement Remarks Chambliss Page 6 At New College, I hope, you have learned that criticism is not treason and that honesty, while it may get you in trouble sometiQeS, probably fairly often, also helps you sleep hetter at night and makes laughter come more easily, and sometimes may even improve your little piece of the lvorld. In closing, I hope that you've enjoyed your time at New College. And I sincerely hope that you did some things that you couldn't do anywhere else. And I hope that you aren't too disappointed that I'm not offering you any helpful advice about what to do now. That's not my job. Remember, "In the last analysis, each student i.s responsible for his or her own life." Thank you.